I’m trying to come up with a portable, not too complex and not too big knitting project to take with me to Norway. I have an enormous stash of beautiful, gorgeous yarn to choose from (what’s pictured above is but a teensy sampling), but lately I just don’t know what to do with any of it. 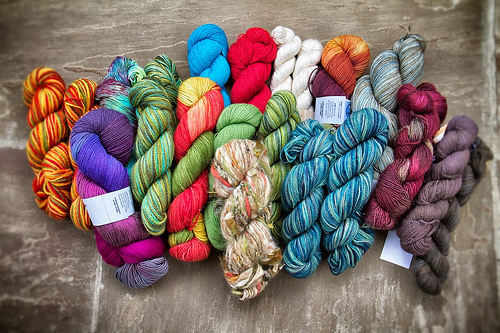 One of the great ironies of my impressive yarn collection is that I’ve bought most of it while vacationing (I like to drive my travel partners nuts with my insistence on visiting local yarn shops — known in knitster lingo as the LYS). That means that I buy a skein here, a skein there, maybe two, and that results in not a necessarily enough yarn to use for most projects. For example, I’ve always wanted to make Clapotis by Kate Gilbert (Knitty, 2004)but it requires 820 yards, which is quite a bit. I also really like Colour Affection by Veera Välimäki, and it looks like you might be able to use say, three different colour ways that work well together, but I can’t be sure without buying the pattern first. All I can find out from the description is that it requires 1155 to 1200 yards, total. Izhitsa by Patusha looks lovely but the pattern isn’t available in English yet, and the yardage needed is unknown. The Weekend Shawl by Anne Kuo Lukito is also lovely; it needs between 598 and 750 yards depending on what yarn weight you use and what size you make. As for lace, I really like the Swallowtail Shawl, definitely doable with 100g of sock yarn, and definitely not too difficult. Ooo thanks for the tips Sasha! I totally voe for a clap with one big bad skein of sock yarn! I knit a clapotis with two skeins of sock yarn. It turned out to be WAY to big, but I love the weight of it. I’d vote for a clap with one big bad skein of sock weight! Ooo that’s good to know Angie! I found a pattern finally after some extensive searching called the Sausalito Smoky Cables-and-Lace Cowl — which is wonderful because I’ve been wanting to make a cowl for a while, and it’s just the right specs to use my single gorgeous skein of Madelinetosh Tosh Sock in the “Cove” colourway (smokey tans and barely-there blue). But I’m thinking if I do that, I should pack a back-up knitting project, because I suspect I could finish the cowl in the first jaunt of flights! Perhaps Clap is it!